Swiss power and automation technology specialist ABB has announced that it has inked a contract with Metsä Group to supply the complete power and process electrical systems for the company’s new bioproduct mill in Äänekoski in central Finland. 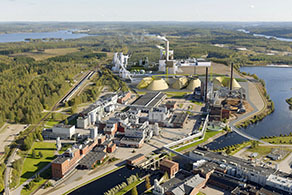 Metsä Group’s new bioproduct mill, scheduled to begin operation next year, will be the world’s most energy-efficient pulp mill, generating twice as much power as it consumes. “ABB’s pioneering technology solutions will support the mill to maximise its bioenergy production and thus, increase the share of renewable energy in Finland by more than two percent,” ABB said in a news release. The mill will produce 1.3 million tonnes of pulp annually, as well as a number of bioproducts such as tall oil, turpentine, lignin products, bioelectricity and bark-based solid fuel. “We have long experience of good cooperation with ABB. Their wide product portfolio, project expertise and high degree of domestic content affected most our decision”, said Timo Merikallio, project director of Metsä Group’s bioproduct mill. “We are extremely happy that we can participate in the largest investment in history of the Finnish forest sector with our expertise and products,” says Tauno Heinola, Country Manager Director of ABB in Finland.